The “Metzgergasse” in Buchs was redeveloped as part of the urban pedestrian area and designed as a special meeting place for all kinds of events. 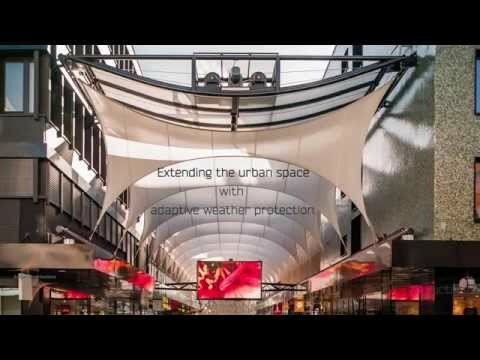 For weather protection, the 11m wide and 50m long lane in the heart of the city was equipped with an convertible textile canopy. Within 5 minutes the street area can be completely covered by the automatic driven membrane roof of 525sqm. The foldable roof membrane slides along 4 parallel rails. In a sequence of dynamic elements, the textile fabric spans between ridge and valley belts in an average height of 6.5m above street level. The folded membrane is parked under a light canopy, forming a gateway into the “Metzgergasse”. Above the canopy the central driving unit is located, moving both sides of the membrane simultaneously. Due to the spatial geometry, the textile membrane becomes perfectly prestressed against wind loads. Often a very strong wind blows through the Upper Rhine Valley, crossing the Alps. The relevant wind loads for the roof structure were determined by advanced wind tunnel testing. The membrane was converted of a PTFE fabric, corresponding highest quality standards. Polytetrafluoroethylene (Teflon) is chemically inert and absolutely UV resistant, natural color is white. This aesthetic architectural fabric is also characterized by high translucency of 38% and is manufactured by the Swiss SEFAR AG.